The rise (and some might say fall) of the vegetable box scheme has been one of the hallmarks of the change in the way we get produce through our front doors in recent years. The problem for me with box schemes however was not so much the lucky dip contents of the box*, but the ‘we’re in your area on Friday and can leave it by your door’ delivery. My front door is shared by two other households, and is 4ft from the street, there’s no garage, neighbour or porch to leave my valuable vegetables in. And so this is where, for me and indeed many others who aren’t at home during the day, the box scheme falls foul of the cheek by jowl nature of most residences in the capital. There are something like 600 box schemes running in the UK today, and one of the newest is Farm-Direct.com established in 2009 by Robert Baker. His scheme however, is a little different from the big boys like Riverford or Able and Cole. As well as being a lot smaller, it serves at present only one area of North London. Last summer Robert took premises in an old building a mere mirror, signal and manoeuvre from the thundering thoroughfare that is the Holloway Road. The road, and the A1 it leads to lies at the end of a route for produce into London from the North since the Roman’s laid the first stone of Ermine Street. Robert found a lot of producers were making night time runs into town to deliver to the wholesale markets, or shops. And so got them to drop stuff on on the way in. Customers browse his website, order what they want by the Thursday, then the orders are delivered on Saturday and Sunday, when most people stand a chance of being in. Delivery costs a few quid, but if there’s another residence in your street also signed up, it’s free. Incidentally Tim Heywood did an interesting interview with Guy Watson from Riverford recently, where he talked about how relatively efficient lorries are at moving large amounts of produce about. What’s less efficient is the vans out delivering the boxes. Because of the smaller foot print of Robert’s business, and the fact it is, in his own words, ‘no frills’, he’s averaging eight drops an hour. The boxes meanwhile are just simple wooden fruit boxes, and maybe it’s just me, but people are less likely to sling out wooden things than cardboard or polystyrene? But crucially you can go and pick your box up at a time that suits you, and not the other way round. When I first met Robert in the summer of 09 he’d just taken delivery of a fridge from M&S, and had a handful of customers on his books. Last week the place was packed with people nipping in and picking up their boxes. He’s begun to carry items for sale directly now too, meaning existing customers who collect can top up, increasing amounts if needs be. This retail element also acts as a way to get people in off the street so Robert can explain the process and get a leaflet in their hand. On my last visit had like jeruselem artichokes, fresh herbs, celeriac, goose eggs, as well as more mainstream items like carrots, apples and spuds. And so to cost. Robert’s admits he’s operating on small margins, but he also has very little overheads, so produce from him works out rather competitively. That’s right, organic beef from Essex for the same price as Ocado’s budget range – a range I’ve nothing against, but the above goes to show that farm-direct doesn’t hit you in the pocket. And then there’s things that you never see in a super markets, such as wild garlic from Martin Mackey Ripple Farm Organics, Canterbury, Kent and a mere £1.35 for 90g, Marfona Potatoes, a haunch of venison, or the charming ‘3 chicken eggs and 3 duck eggs’, yours for £1.50. 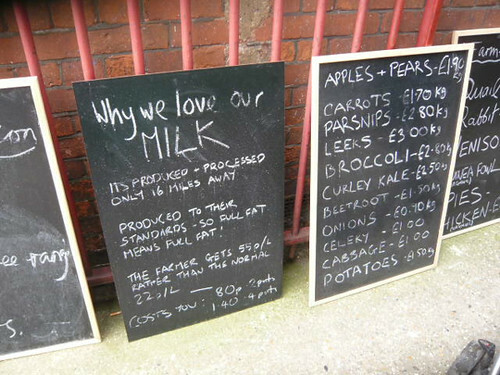 Farm-direct does a great job of getting small producers products together in one space and selling them at a very competitive price to people who want them, including it seems, live chicks for a customers garden, you can’t see Ocado doing that can you? When I was younger and extended family came for a visit mum would do a lunch. On the day itself was an air of palpable excitement in the house, extra cleaning had to be done, a special lunch was planned, and no one was allowed to use the loo or make a mess anywhere until the guests had arrived. As the allotted hour of arrival approached me and my sister kept station at the front window listening for the sound of a car in the street outside. Meanwhile in the kitchen the kettle was practically kept at a rolling boil, ready for the cups of tea and a full debrief of the traffic conditions and journey highlights. Later we’d all sit down for lunch; probably salad and cold cuts in the summer, or something meaty in the winter. Then with the meal over, the blokes would help clear the table and then move into the lounge or out to check oil in cars and have a crafty fag, while the aunts, mums and grandma did the dishes. Us kids were press ganged into putting away, and I always found that the washing up was where the real gossip, chat and exchange of views seemed to happen. Back then no one owned a dishwasher, and washing up – like shelling peas or licking the cake bowl – was part of the food production process. I remember the chatter mixing with the chink and clatter of dishes and the tea towels that put in three minute bouts before being too wet to use and had to be replaced by new ones. When domestic order was once again restored, more tea was put on, as was the telly and we all settled down, the world now put to rights. I mention this vignette from yesteryear because a few weeks ago some old BBC friends came round for Sunday lunch. We had some special sixty-day aged beef that my friend Theo at the Ginger Pig’s Hackney branch had set aside for another customer who’d changed his mind at the last minute apparently; his loss was our gain is all I’ll say. 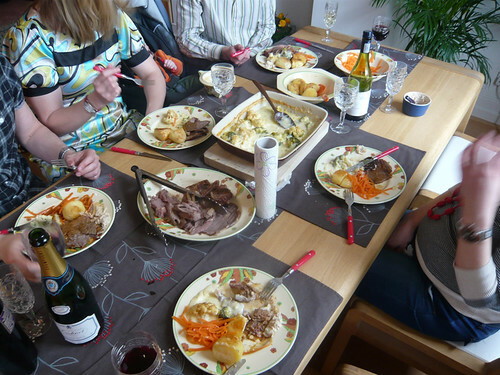 The lunch was lovely, lashings of wine, tasty gravy, cauliflower cheese and roasties. The spuds for the roasties were Cyprus, a potato I’d never roasted before, and my friends did look at me a little oddly when I told them I had a practice run with one potato last night just to make sure nothing went wrong. Anyway, with the lunch over I began to scrap the plates and run the hot tap for washing up. This is when my friend Neil chipped in with ‘let me help you with the dishes’. Washing up on your own is dull, washing up with a friend is a chance to confide and talk to each other in a different way. You’re both engaged in a task, so there’s all the dealing with ‘you’ve missed a bit’ and ‘where does this sieve live?’ stuff. This of course runs concurrent with the big life issues of love and loss. It’s a sort of duet, a dance; a totally different space and activity on which to host a conversation, different things are said than at the table. Let’s face it, no one ever says ‘ooh let me help you fill the dishwasher’, that’s just boring. You try it next time you have people round, make washing up part of the whole process. It gives both host and guest a chance to talk in a more personal way. You also end up with a nice clean kitchen, and all your pots and plates put back in new and unusual places. a World Renowned CHEF and a FOOD FUTUREOLOGIST? The answer is general confusion if last night is anything to go by. Oh where to begin? 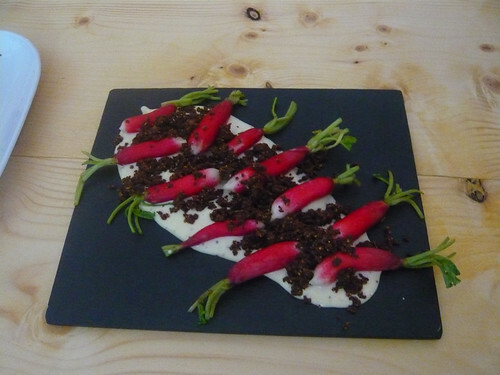 As a food journalist and an ex-Central Saint Martins graduate the prospect of a food/art event in East London organised by MA students from my alma mater sounded like the sort of hip, urban, fusion event I should attend. And attend I did after an invite from one of them via twitter. About 7ish I found the venue, and upon entering was given a booklet (more on this later) and told to experience the food, particular attention was drawn to the accompanying green stickers that I was to stick next to each course after I’d tried it – right. 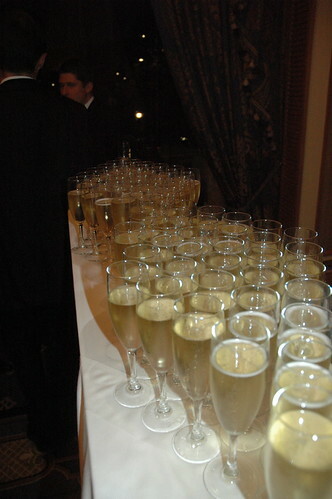 The hosts broke the cardinal rule of London event organising by not having a drink ready on arrival, there was one girl pouring out water, no one handing it round, and lots of cocktail glasses and wine glasses standing empty on the table. Confusion seemed very much in charge. Wandering round this table to the kitchen I heard someone exclaim ‘everyone’s come at once!’ The kitchen obviously couldn’t cope, and that left me, Chris, Lizzie, Helen and Charlie waiting, for what seemed like an entire epoc. When the food did issue forth from the kitchen there wasn’t really enough to go around. And so to the menu, which was a prime piece of codswallop marinated in nonsense. I almost resent typing it out but here it is. Asparagus in textures, cooked and raw, gelee and granite with garnishes. Crisply chopped? Prepared many ways? I tried one dish with slices of courgette on, was the number 8? There were no flowers on it, but there was a sphere of something and a pickled onion sort of thing – I didn’t know where to stick my sticker. I think number 2 had to be the worst. It was a tiny carrot, topped with tasteless foam, next to some frozen carrot pulp, the entire lot tasting of…cold wet carrot. Eventually one chap then started making something to drink other than the water. A single shot of vodka was measured out slowly from a solitary bottle, added to a ladle of lychee juice and then divided into four glasses. I’m no a ligger or a lush, but the bare minimum when you invite someone to a food and drink ‘event’ is to provide plenty of those two very things. I was offered a berry bundle. It was a raspberry (from Tesco’s across the road according to the packet in the kitchen) wrapped in jelly, unsurprisingly it tasted like a raspberry. And so to the accompanying booklet. As Chris said ‘I’ve read it three times and I still don’t understand it’. 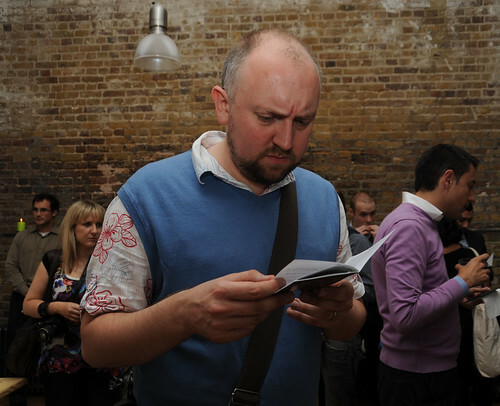 I had a read, I tried to get into it, I really did – look at the concentration. But my eyes kept sliding of meaningless words and pointless graphics. What on Earth does that mean? That makes no sense whatsoever. Over the page were more bonkers graphics, such as this. Mind. Body. 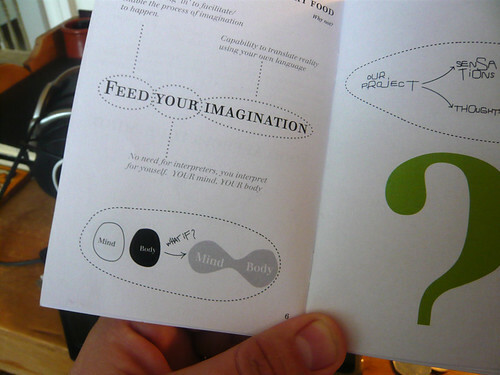 What if… mind and body were joined? Hands up who’s mind isn’t joined to their body? But the best of all was the following on the ‘who are we’ page. So far I can forgive the random caps scattered throughout the book, but of all the words to misspell professional is very much not the one (The other howler was characteristics in the paragraph above). I went to art school so by default I can’t spell either, but if I was getting something printed I’d at least get it subbed. Making anything is hard work, I know that, but these are MA students doing a masters for heaven’s sake. If they’d spent more time on the food and the organization and less time on the navel gazing arty nonsense it could have worked. As it was it was just really unclear what exactly we as an audience were supposed to be doing; and eating a raspberry does not make me re-establish a magical connection with the Universe. Art and food have a long and close relationship, from the Last Supper to Sarah Lucas’ two fried eggs and a kebab. This however had the feel of an event put together by a losing team in an early round of the Apprentice. What’s more they charged people for this event, and once you’ve asked folk to put their hand in their pocket and pay for something they expect to get it. If this had been a free event (though it was to me) I wouldn’t have minded so much, I would have said ‘well done for trying’. But my friends had paid £30 to be there it took alot of beers and lovely Vietnamese food in Old Street afterwards to get rid of the bitter taste of disappointment in our mouths. Two households, both alike in dignity, In fair Leyton, where we lay our scene. The families of both CAMRA and Slow Food came together last Thursday for a tour of East London’s newest brewery. Brodie’s Beers was set up a year ago round the back of the William the Forth pub on Leyton High street. It run by brother and sister James and Lizzie Brodie, James was a Home Brewing enthusiast and Lizzie has a degree in Biological Sciences. Their beers are available in the pub next door, but also in the Crossed Keys in Covent Garden, The Hermit’s Cave in Camberwell, and the King Charles I in Kings Cross. 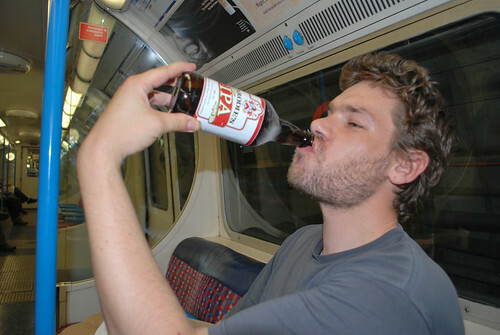 The first beer James produced was an IPA to a recipe he used to make for himself in his bath. It’s available now in bottles, but I’m keen to try some of what’s on tap. First off Brodie’s Red, it’s a chestnutty brew, plenty of flavour. Later I move on to Sunshine; lighter and more golden it’s a perfect summer pint. 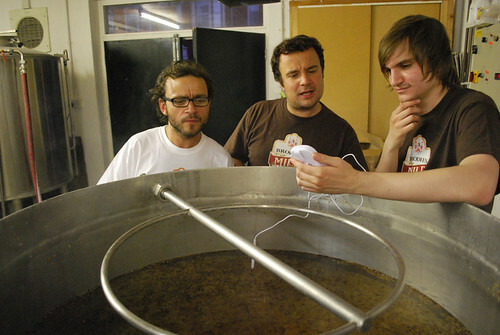 Tonight James is letting 23 year old brewery student Tom Unwin use the equipment to make a brew to his own recipe, which is very nice of him. Tom’s not thought of a name for the beer yet, and so I suggested that Londonist readers might come suggest one, use the comments box on the Londonist version of this article for your suggestions. Malta?! I put my hand in the bag first and out of the 25 countries I drew Malta. My GCSE Geography dusted itself off and swung into action. ‘Small Island, somewhere in the Med, bombed a lot during the war’ it said. But as for food, it drew a blank, along with the rest of my knowledge. The next day when I asked the press person at the Maltese tourist office about Maltese food in London he replied “there isn’t any”. Two hours later I’m sat in the office of the Deputy High Commissioner for the Republic of Malta having Maltese coffee and biscuits. “It’s true, sadly there’s no Maltese restaurants here,” says Bernard Hamilton. Bernard very kindly found 30 minutes at ridiculously short notice to talk to me about Malta, it’s history and people, and it’s relationship to the UK. Churchill once called Malta the ‘unsinkable aircraft carrier’, and the former British colony is now an active member of the Commonwealth. “Our natural resource is our culture and heritage,” says Bernard, a heritage that has been shaped by nearly all the civilisations of antiquity as well as a few modern ones laying claim to the islands. Empire’s come and go, but Malta remains it seems. In fact the main island is home to the oldest free standing structures in the world, these rocks are old. We come on to Eurovision. “Jade was in Malta a few weeks ago. (She was a guest of their act-choosing show) In Malta we take Eurovision very seriously”. It’s front-page news apparently. Malta, you’ll no doubt be aware, (mostly) give us the maximum 12 points no matter who we send to the competition (yes even Scootch). They are our last unsinkable ally against the axis of eastern Eurovision dominance, our brothers in arms, as Mike Atkinson says in the Guardian ‘we owe them’. I move the discussion on to food. Bernard talks about the coffee we’re drinking, which is flavoured with fennel, cloves and something called cikwejra, which it turns out is chicory. The traditional flavoured coffees are falling out of favour, being replaced by the standard Italian styles. We also have some little dry biscuits to dip into the coffee. We move on to more substantial matters. “The national dish is rabbit,” says Bernard. “Families often keep their own rabbits to eat, and so consequently look after them well”. 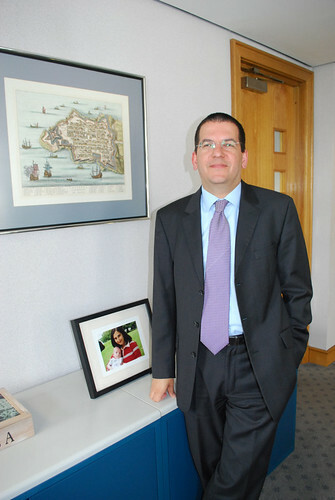 We talk some more about being a diplomat, Bernard won Young Diplomat of the year for his consular work, and the day to day tasks of the Commission, which are dealing with visas, promoting trade and tourism, and helping look after Malta’s interests in the UK. Before I leave Bernard very kindly gives me some Maltese wine, a 2006 Medina Vineyard. It’s a blend of syrah, Grenache and carignan from Delicata and gratefully received. I head back home and get a call from one of the other leads I’d frantically found earlier in the morning; Barbara from the Maltese Cultural Movement. We arrange to meet in a pub in Highgate, as she’s a few Maltese treats for me. 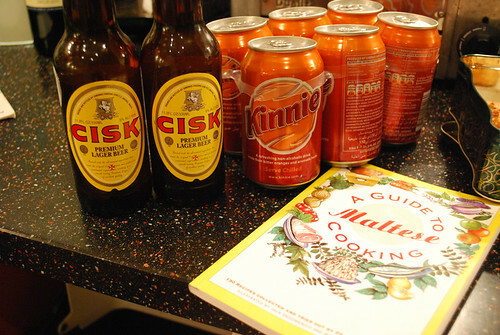 These turn out to be some bottles of Cisk (pronounced Chisk) lager, six cans of Kinnie (a bitter/sweet soft drink native to Malta) and some Pastizzi – the ubiquitous (in Malta anyway) snack. Pastizzi come with either ricotta or pea fillings, and each village baker has their own way of making them – all done by hand. The ones I’ve got are frozen; I’ll be having them during Eurovision. If you want to try some either order them off Barbara or keep an eye out for Cynthia who runs www.ilovepastizzi.com and does some of the markets in London. Kinnie is a bitter drink made from oranges, but with slight aniseed notes. It’s reminds me of Campari, and is probably best served ice cold in a little café in Valetta. It’s the Irn Bru of Malta. Barbara also gives me a rabbit recipe, and here it is. 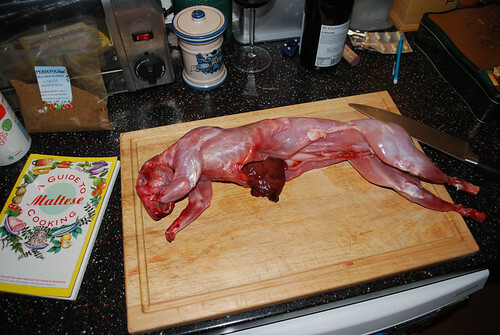 Fry the rabbit in a shallow oil and add half the garlic, season with salt and pepper. When the rabbit is golden in colour add the bay leaf for about a minute then take out the excess oil. 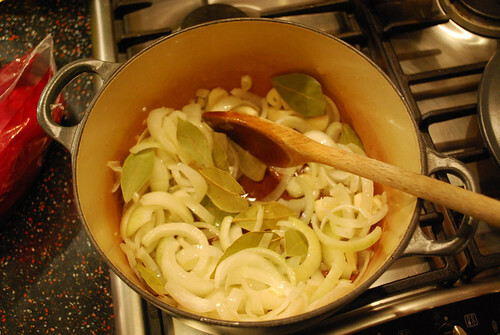 Add the rest of the garlic and fry a little before adding the white wine and simmering until tender. Garlic it seems is key it seems to Maltese cooking, and indeed ‘did you put the garlic?’ is the blog name of a second generation Maltese Mary Rose who I met next. Mary-Rose was born in Melbourne to Maltese parents, she went to and fro between the Island and Oz before eventually settling in the UK. We arrange to meet at St Pancras at 7:45 and since finishing work at 6 she’s been home and baked me some cakes – I’m aghast. She’s also got a Maltese cookbook to lend me “my mother thinks this book’s rubbish” she says. 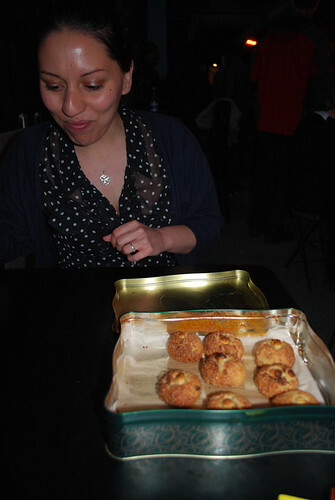 The cakes are Pastini tal coconut, and here’s the recipe. Rub the flour and butter together, them mix through the coconut. Then mix in the sugar and vanilla essence. Whisk the eggs into the mixture. Roll into little balls and decorate with glace cherries or almonds. Bake for 10-15 minutes at 200 degrees. ‘My mother always makes these in huge batches” says Mary, who then goes on to tell me about the pleasures and pitfalls of a Maltese mother. It seems that Maltese mothers are at the heart of the home, and Malta is a place where many traditional values are still present (The word for wife is the same as for woman). “My other half says it’s not so much backward, as just in a time warp”. Mary goes on to talk about everything from the Maltese film industry to post war rationing to her mother’s lack of a toaster and the joy that is hobz biz-zejt. The later is literally translated as bread and oil, yet is more of an open sandwich. Take the traditional Maltese bread and place ripe sliced tomatoes on top, then add capers and tuna, before drizzling on a lot of olive oil. “This was often my lunch at School in Melbourne, when all the other kids had veggie-mite sandwiches” says Mary. Stuffat tal-fenek aka stewed rabbit. Rabbit (plus liver and kidney’s). Red wine. Garlic. Onion. Tomatoes. Bay leaves. Spices (Chinese five spice). Salt & Pepper. Peas (Marrowfat). Sauté the rabbit with onion, garlic and wine and tomato sauce (made from more onion, garlic, bay leaf, spices and wine) simmer gently and add the peas. It’s 9:30pm by the time I get back home, and the aim of the stew is to cook it long and slow so the meat’s almost falling off the bones, so this is very much going to have to be a dish for tomorrow. I’m not very good at following recipes while cooking. Some people can’t be with out them, relying on them as a classical musician might rely on sheet music. I tend to riff a little when it comes to cooking, Barbara’s recipe calls for Chinese five spice, Mary’s book calls for curry powder and some pork belly. I’ve got none of these in the house, so opt for a tea spoon of garum masala. I just remember what Barbara said, ‘lots of garlic and bay leaf’, and put in loads. Next, the rabbit. Why I think rabbit fell out of favour and was replaced by chicken is that when it’s laid out in front of you, it looks like a dead skinned animal, where as a chicken – upside down with legs and feet off – just looks raw. The way to deal with any squeamish thoughts you might have is to just get stuck in and cut it up, once you’ve broken the form it too can just look like raw ingredients. I chop it down into legs, loin and other bits, deciding to leave the head out, and brown it in the pan having first removed the onions and garlic. 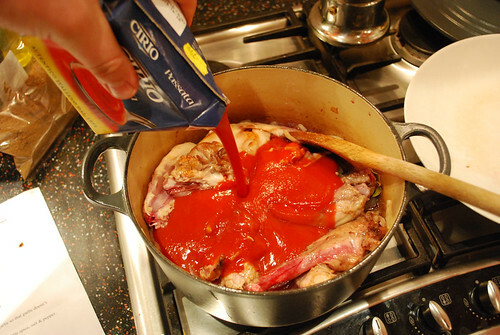 I put the lot back in and add a glass of Bernard’s Maltese wine and a carton of passata, bringing it up to a high heat. Lastly I add the liver, which is very delicate. Barbara recommends frying this with more garlic and oil before adding a splash of malt vinegar and eating – but it’s now getting on a bit so I just add it in and hope it’ll flavour the sauce. I set my oven to 100 degrees and pop the casserole in and set the time to turn off at 6am, giving 7 hours of long slow cooking. Most recipes call for peas to be added, Barbara says marrowfat are the best, but I’ve only got petit pois and they’ll have disintegrated after 7 hours cooking so I decide to add those when I reheat it tomorrow. 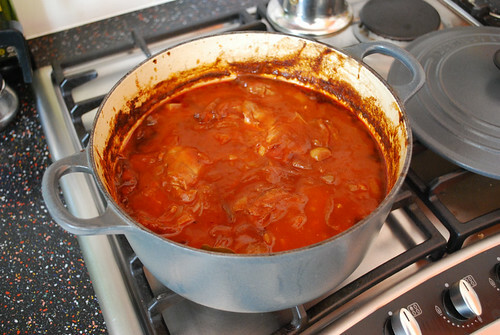 This morning the stew looks amazing, the sauce has thickened and darkened considerably, and the rabbit is soft and moist. Traditionally you would spoon off some of the sauce and have that over spaghetti as a starter, then have the meat with potatoes as a main course. Which is what I intend to do, with a glass of Maltese wine, an appetiser of pastizzi or two, and a drink of Kinnie. When I woke up on Friday I knew next to nothing about Malta, and bugger all about its food. In 24 hours I’ve had coffee with the deputy high commissioner and sourced Maltese products and recipes first hand, which is exactly what Eating Eurovision is all about. As I said in the guidelines, most people are proud of their heritage and culture, and want to share it, and that makes the world a better place. There may not be a Maltese restaurant in London, but there’s lots of people who are proud to be Maltese, and who knows, maybe it’s time for one. Wooo! I’m very pleased to say that the Big British Food Map has made the shortlist of the Association of Online Publishers 2009 Awards. It’s in the commercial partnership category. As you may be aware Ford sponsored the project, lending me at brand new Ford Focus econetic which I only dented once (this tree came out of nowhere type thing). Hmm, strong showing from the Guardian there, that might be tough to beat. Incidentally Sunday just gone was the day I started the Big British Food Map, in fact this time last year I was getting clamped. Anyway, Fingers crossed for AOP glory and good luck to the other Channel 4 projects and products in the other categories. Occupying my spare time for the next few weeks is my latest project, Eating Eurovision. The premise? Can 25 food bloggers eat the cuisine of the 25 Eurovision finalists in 25 hours all within the M25? If you want to join up, get yourself along to our Ning group. Should be good fun, now I wonder which country I’ll get…?